Systematic reviews of empirical studies provide the best evidence for the relationship between health and weather or climate factors, but such formal reviews are rare. In this section, we assess the current state of knowledge of the associations between weather/climate factors and health outcome(s) for the population(s) concerned, either directly or through multiple pathways, as outlined in Figure 8.1. 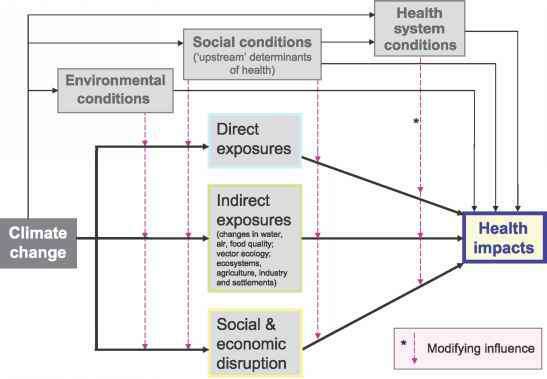 The figure shows not only the pathways by which health can be affected by climate change, but also shows the concurrent direct-acting and modifying (conditioning) influences of environmental, social and health-system factors. • heatwaves and flooding can have severe and long-lasting effects. 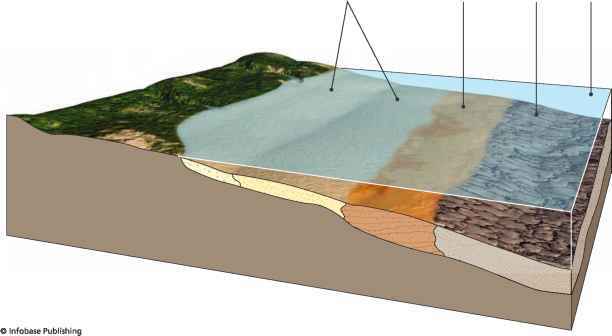 The effects of environmental temperature have been studied in the context of single episodes of sustained extreme temperatures (by definition, heatwaves and cold-waves) and as population responses to the range of ambient temperatures (ecological time-series studies). Hot days, hot nights and heatwaves have become more frequent (IPCC, 2007a). Heatwaves are associated with marked short-term increases in mortality (Box 8.1). There has been more research on heatwaves and health since the TAR in North America (Basu and Samet, 2002), Europe (Koppe et al., 2004) and East Asia (Qiu et al., 2002; Ando et al., 2004; Choi et al., 2005; Kabuto et al., 2005). A variable proportion of the deaths occurring during heatwaves are due to short-term mortality displacement (Hajat et al., 2005; Kysely, 2005). Research indicates that this proportion depends on the severity of the heatwave and the health status of the population affected (Hemon and Jougla, 2004; Hajat et al., 2005). The heatwave in 2003 was so severe that short-term mortality displacement contributed very little to the total heatwave mortality (Le Tertre et al., 2006). Figure 8.1. Schematic diagram of pathways by which climate change affects health, and concurrent direct-acting and modifying (conditioning) influences of environmental, social and health-system factors. among the elderly and outdoor workers (Chaudhury et al., 2000) (see Section 8.2.9). The mortality figures probably refer to reported deaths from heatstroke and are therefore an underestimate of the total impact of these events.